“Brutal” was the word used by several MPs as they left tonight’s meeting of the Parliamentary Labour Party. Even by the bad-tempered tone of the Monday night meetings since Jeremy Corbyn’s election as leader, the latest session was something else. 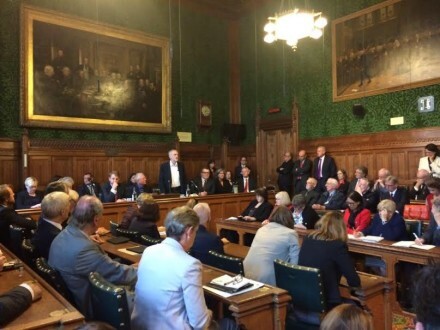 With discussion of the motion of “no confidence” in Corbyn scheduled for discussion, the room was packed to the rafters; even the leader’s staff struggled to get in the room. It meant both the discussion and the venue were heated: “It was like a pressure cooker” said one figure who was there. It began with an old tradition – of applauding the party’s newest MP, Rosena Allin-Khan – and ended with a shouting match in the corridor between a backbencher and one of Corbyn’s press team. Early in the meeting, newly-appointed shadow Energy Secretary Barry Gardiner made a speech in Corbyn’s defence, but was met by jeers. Many MPs were unhappy that a frontbencher had been called, at what they felt was supposed to be an opportunity for backbenchers to communicate with the leadership. No other frontbenchers were called. No other defences of Corbyn were made. There were criticisms from across the party. MP after MP urged him to resign for the good of the Labour Party. Chris Matheson, from the party’s left, told the leader he has “got to step down” and received cheers. Alan Johnson took responsibility for last week’s referendum result, but warned Corbyn that he had to take it too – saying his team did not even turn up for the scheduled weekly meetings during the campaign. Rob Flello said that he had never publicly criticised the leadership (“Check my Twitter account!”) but felt compelled to add his voice to those urging a change of leader. Ian Murray, who resigned as shadow Scotland Secretary yesterday, criticised the tactics of pro-Corbyn campaigners who target Labour MPs’ constituency offices, saying: “They’re your people. Call off the dogs.” A senior source added that some MPs had shouted “scumbags”. It did not escape the attention of some furious MPs that several pro-Corbyn figures slipped out during these exchanges to address the Momentum rally outside, where chants included one about “red Tories” and another that simply repeated the word “deselect”. Reports that speakers at the rally encouraged demonstrating outside constituency offices apparently led to a confrontation between Conor McGinn, a serving whip, and John McDonnell. But the message from Corbyn’s team was clear: those who want Corbyn to go will have to defeat him in a leadership contest. They repeated their line that he will not give way to “a corridor coup and backroom deals”. Later, a spokesperson for Corbyn said: “If people want to mount a challenge they can do that right now. Jeremy will be a candidate in that election”. The pressure is clearly taking its toll on all involved. As well as the argument between McGinn and McDonnell, John Woodcock and one of Corbyn’s spokespeople had a stand-up row over negative briefings in front of a group of journalists. The ballot opens on the vote of no confidence in Corbyn at 9am tomorrow. On the basis of what was seen tonight, it’s unlikely to sort this mess out.